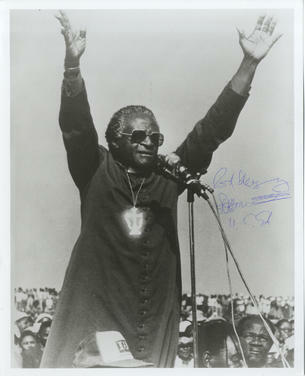 This is a hand signed Black and White photo 10" x 8" by the South African cleric and opponent of the Apartheid Regime. Desmond Mpilo Tutu (born 7 October 1931) is a South African social rights activist and retired Anglican bishop who rose to worldwide fame during the 1980s as an opponent of apartheid. He was the first black South African Archbishop of Cape Town and primate of the Church of the Province of Southern Africa (now the Anglican Church of Southern Africa). Tutu's admirers see him as a man who since the demise of apartheid has been active in the defence of human rights and uses his high profile to campaign for the oppressed, though his consistent opposition to Israel and the United States has made him controversial. He has campaigned to fight AIDS, tuberculosis, poverty, racism, sexism, the imprisonment of Bradley Manning, homophobia and transphobia. He received the Nobel Peace Prize in 1984; the Albert Schweitzer Prize for Humanitarianism in 1986; the Pacem in Terris Award in 1987; the Sydney Peace Prize in 1999; the Gandhi Peace Prize in 2007; and the Presidential Medal of Freedom in 2009. He has also compiled several books of his speeches and sayings.